Betsy Pullen Leitch, 81, of Newton, died peacefully on September 1, 2015 at Rogerson House in Jamaica Plain. Betsy was the daughter of Elizabeth Pullen and Dr. George W. Pullen. She grew up in Brunswick and Camden, Maine, and attended the University of Maine, Orono, earning a Bachelor of Science in economics. She was an early student enrolled in what has become the University of Maine Honors College. After graduation in 1955, she went to New York City, as she put it, to seek fame and fortune. She worked as an economist and analyst for several Wall Street organizations including Prudential Insurance, W.R. Grace, and General Electric. Betsy married William R. Leitch in 1963, and the couple lived in Greenwich Village and Brooklyn Heights, New York. They moved to Newtonville in 1968 when her husband, an editor at McGraw Hills Business Week magazine, joined a small publishing company focusing on technology publications, such as Computerworld. After moving to Newtonville, Betsy chose to dedicate her life to raising children and community service. 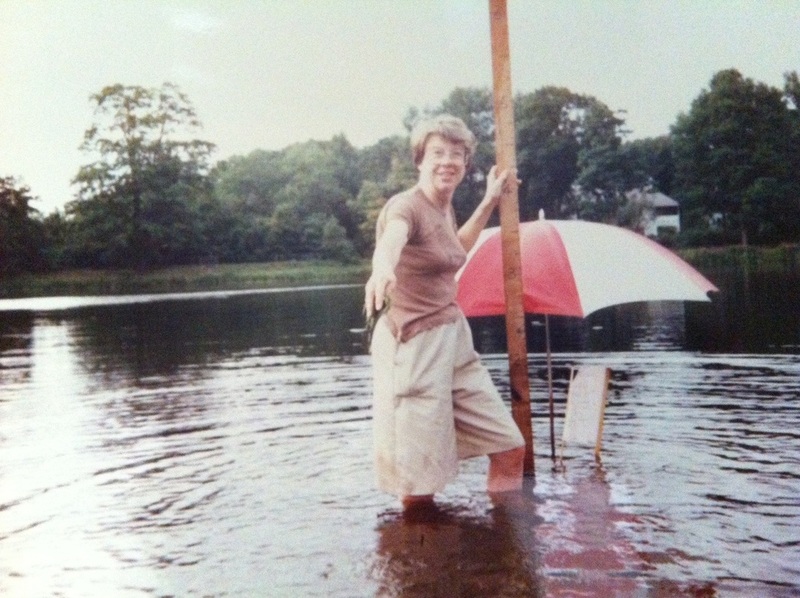 She is remembered for her work in many Newton organizations ranging from Grace Church to Newton Schools and the Bulloughs Pond Association.Read about Betsy's life and achievements here. In 1968, Bill and Betsy Leitch moved to the neighborhood near Bullough’s Pond. Beginning in the late 1970s, Betsy noticed the deteriorating condition of the pond. 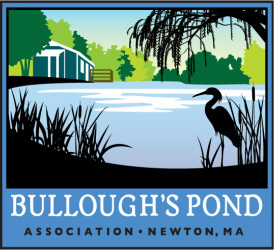 She and Bill founded the Bullough’s Pond Association in 1983 in an effort to encourage the preservation of this beautiful and historic Newton treasure. In this photo, taken in 1990, Betsy was demonstrating how shallow the pond had become from storm drain silting. Betsy led the BPA in campaigning for a dredging of the pond to preserve it as a nature-watching and recreational treasure, and to prevent downstream flooding. After almost a decade of activism, Betsy and Bill Leitch and the BPA were there in 1992 when then Mayor Theodore Mann and State Senator Lois Pines announced that funding and permits were in place to begin a major restoration of Bullough’s Pond. The project began in February 1993. It included dredging Bullough’s Pond, and improvements to the Laundry Brook drainage system. 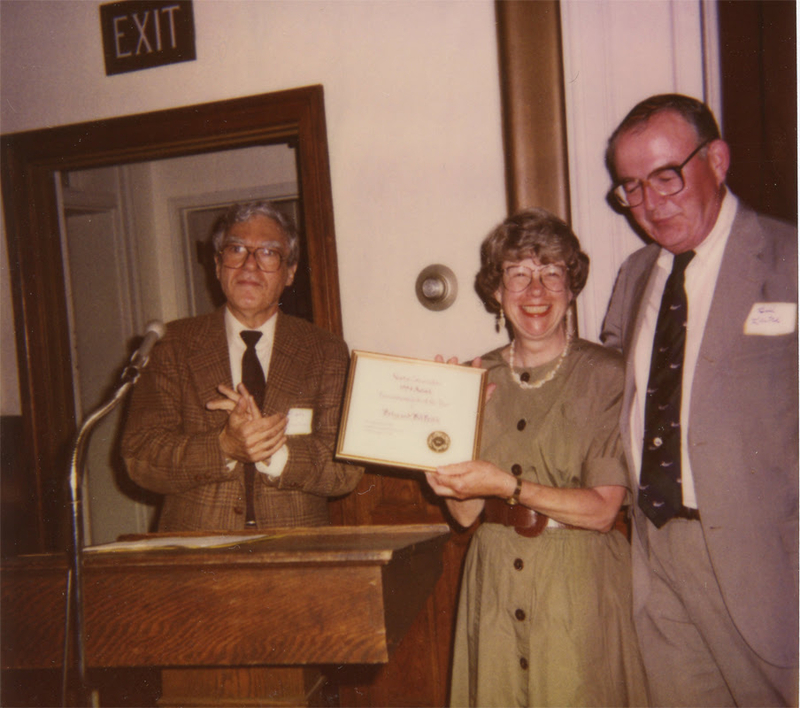 The following year, the Newton Conservators presented Betsy and Bill Leitch with the "Environmentalists of the Year" award for their leadership of the Bullough's Pond Association, and their decade-long efforts to restore and preserve the pond. All of us who treasure Bullough's Pond will always remember and be grateful to Betsy Leitch. Our sincere condolences go out to co-founder Bill Leitch.